It’s a nightmare scenario for everyone with a classic car or a hot rod. 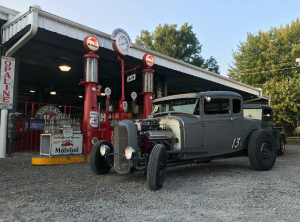 Columbus, Ohio-based hot rodder Nathan Stewart was driving his Y-block-powered 1931 Model A, his girlfriend’s dog in the passenger seat. 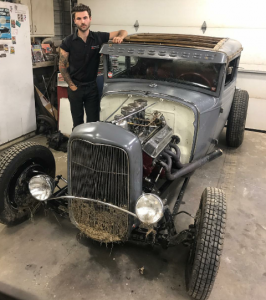 A third-generation hot rodder, Stewart was on his way to his grandparents’ house to help reinstall the top on a 1929 Model A. Traveling around 45 mph, Stewart was just a few miles from the house when another driver pulled out into an intersection in front of him. He was too close to avoid a hit, so he stood on the brake, locked up the tires and gritted his teeth. The Model A slammed into the other car’s rear bumper, bounced off, hit a road sign and tumbled into a five-foot ditch. Hanging upside down with the motor still running, Stewart turned to check on the dog. It was gone. He turned off the car, unbuckled and dropped onto the roof. He was able to crawl out of the passenger window through water and mud, and found the dog waiting patiently on the side of the road. Now that he knew the dog was safe, he turned his attention the wreck. His most prized possession – a car he’d put countless hours of labor into – was upside down in the mud. The Model A has been part of Stewart’s life since before he even had a driver’s license. Stewart was just 10 years old when his father brought home the body and presented it to his son. “Ever since I was a kid I’ve seen this old, beat-up rusted Model A body. The plan was that when I was 16, we were going to fix it up,” Stewart says. And now the car was partly submerged in a water-clogged ditch. 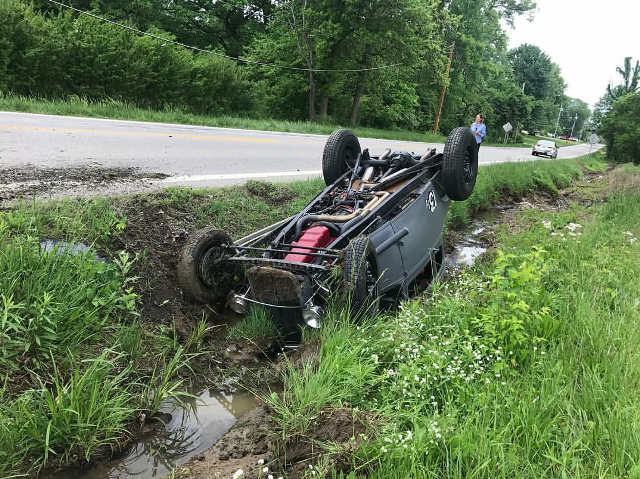 Stewart called his father, who came to the crash site and contacted a local tow company (Al’s Towing in Westerville, Ohio) that he knew would take care in getting the car out of the ditch. The car suffered a number of dents and scratches from hitting a road sign, mostly on one quarter panel and the driver’s side door. The grille insert was mangled and the front axle was bent, and a few other parts (including a front wheel) were also either bent or busted. Getting a proper insurance estimate on a car like this – which is not only a classic vehicle, but also packed with custom parts – is not easy. Stewart lucked out in that he has a family friend that is not only a hot rodder, but also has a body shop. That shop owner was able to write up an accurate estimate. As it turned out, State Farm was able to send out an adjuster that specialized in classic car claims. The shop and the adjuster were able to agree on an estimate (roughly $14,000), and once Stewart had the check in hand he spent many long nights working on the car. 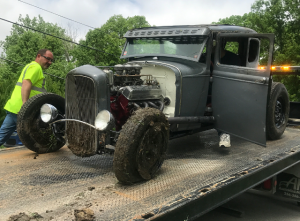 Within a month of the crash, the Model A was back on the road. 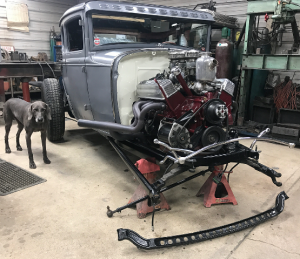 While there is still a bit of work to be done on the hot rod (a paint job is likely in the works), Stewart has turned his attention to another pet project – building a replica Chassis Research dragster. He also plans to build his own shop with living quarters this summer. He considers himself lucky that neither he nor the car suffered any irreversible damage.